LAST NEWS!! (May, the 7th 2007): A new compilation of Metagraf for use with Java-6 has been done: Metagraf-6. Java-6 has changed the serialization process, so the Metagraf-5's files saved as XML's with Java-5 can't be read with Java-6. This new compilation that I'm announcing, will work fine with Java-6, BUT the interchange between Java-5 and Java-6 is not possible. I advise to maintain a Metagraf-5 version with the corresponding Java-5 virtual machine, if files created before are needed to be edited or modified. The executable file, mg6_OS.jar that can be downloaded and should be copied as the old "mg5.jar" in the directory Metagraf-5. If in Unix: "cp mg6_unix.jar /PATH TO METAGRAF DIRECTORY/mg5.jar". If in Windows just "copy" and "paste" the file downloaded to Metagraf-5 and change the name so that MG.bat can find it. Alternatively, create a second MG.bat as MG6.bat and point it to the downloaded file. Download the "jar" file for Windows or for Unixes. NEWS!! 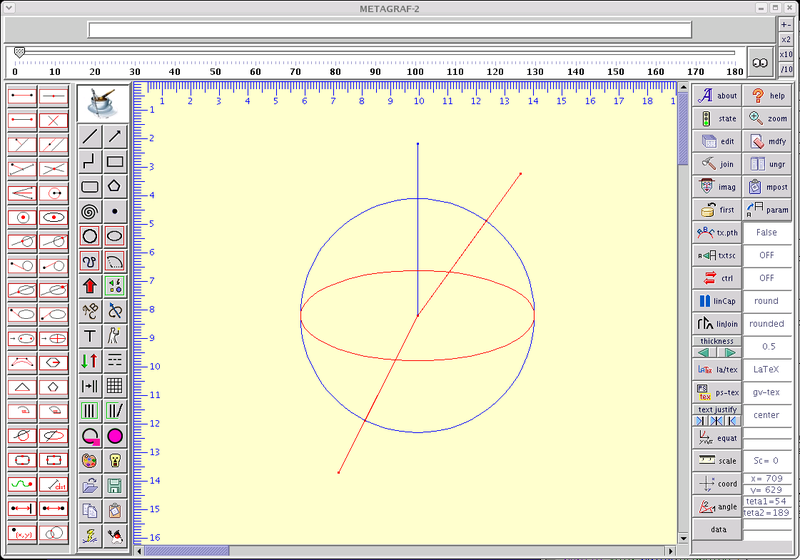 (February, the 22th 2006): At last Metagraf-5 is available for download almost in time with the (last) promised schedule. Please read the comments below on installing and others. There are short and can save you a lot of time and misunderstandings. There are two files, one for Unix and one for Windows. The Unix files have been tested in Linux, SuSE. A few examples used in testing as been included in the directory files. They can (and should) be removed after testing them. Metagraf-5 needs imperatively to run Java-5. It can be downloaded from here. If you are using Windows and you don't have WinZIP, download and install it. Install the Java-5 JRE as has been said. Download Metagraf's package, below, and extract it with WinZIP, placing it just in C:. A directory with the name: Metagraf-5 will be created. 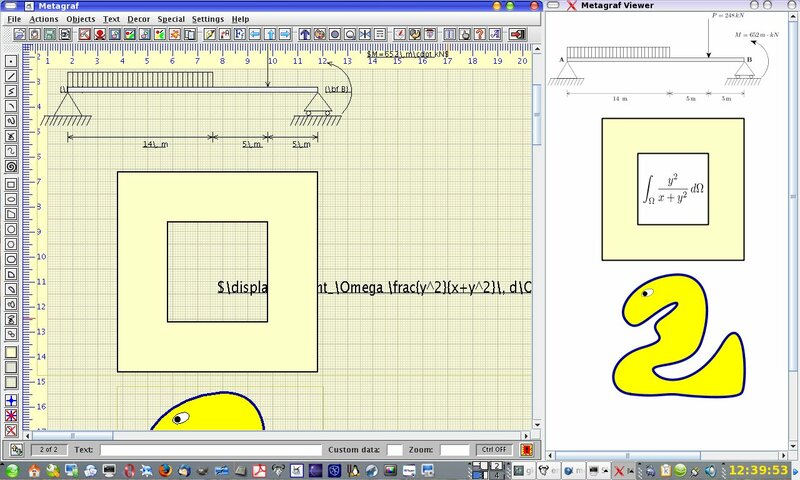 Create a direct access to the file MG.bat and put it on your Desktop. Use the icon furnished in the head directory Metagraf-5. If you are using Linux, install the jvm JRE-5 if not already done. (SuSE includes it in its repository). Download Metagraf's package and place it in your preferred place. Then: tar xvzf metagraf-linux.tar.gz will create the directory Mg5-01 . Go into the directory and type java -jar mg5.jar to test everything. Once Metagraf-5 is running, click on the Help button and READ everything. It is short but very important. If you have any doubts or problems AFTER doing it, write to the list. Remember that Metagraf needs Latex, including Metapost, installed in your computer. After the first days of trying Metagraf, send email to the list or to me with your comments, suggestions ... etc. In short, feedback, please. Finally, don't forget to qualify this new version, below the downloading links. NOTE: This is a first implementation of Metagraf-5. Some items have not been implemented yet, as a more formal Manual or the keys-list. Everything will be done in short time. LAST NEWS!! (January, the 31th. 2006): I'm already writing the User's Manual/Help. Please a few days more of being patient. I hope to have everything available around the middle of February. I think that it is very important to have a well done and understandable Help-on-line. Thanks. (January, the 10th. 2006): It has not been possible. Sorry... Anyway, good news: I've been able to solve my biggest problem with Windows and now everything works very well. This week I will finish the "gross" part of Metagraf and I hope, this time with certain confidence, to be able to release it in a few weeks (no more than four). Not so complet as I would have liked, but fully usable. Thanks for your patience!! LAST NEWS!! (November, the 8th. 2005): The all new Metagraf, that acording with Java's name will be Metagraf-5, is almost finished. It is a lot simpler and easier to use. Also much more complete, althought the "variational geometry" has been removed. Have a look at the new aspect of the screen, just below. Everything is included in the menu and the toolbars can be removed if preferred. Lot of settings for everyone to choose his preferences...etc. I'll try to make it available before the end of the year. Please, send feedback!! NEWS!! (June, the 23th. 2005): One year of silence. I apologize. Now it's time to say something and I have indeed, something to say. I've been studying the new Java5 and, to my satisfaction, I've found many new capabilities that can be used to give to Metagraf great new possibilities. I'm already running a (private) version that output the old *.bmg files as totally readable *.xml files. This means that the drawings will be compatible between new virtual machines and version of the applications. So, I have decided to modify quite a lot of the last Metagraf2 to convert it to Metagraf5 (according with the names given to the java-virtual-machine). There will be an important increase of possibilities: layers, all type of NURBS, pasting of big paragraphs written inside boxes, output readable in XML and Metapost, Graphics of math-functions normal or parametric... and so on. All that will take some time so I ask you to be patient and send me your opinion on new "things" that you would like to see implemented in Metagraf. NOW IS THE RIGHT TIME TO DO SO.!! Please, do it. SOME MORE SHORT NEWS (May, the 10th. 2004): The Manual/Help written up to this moment, two chapters and one Tutorial, can be downloaded from this site. It is a "tarball". Once decrompressed in a directory, from inside the directory can be launched with: "java -jar help.jar". It is written only in Spanish, the English translation should be available in a couple of weeks. I have begun using a very nice tool to write Java. It's name is Simplicity PRO and I take advantage of this page to recommend it. LAST NEWS (May, the 4th. 2004): Many new tools already implemented. It is possible to rotate and scale objects directly, seeing them as they change. A lot easier than before. An interesting new tool: the point that draws a line as it is moved with the arrows of the keyboard.. It gives a lot of new possibilities. See for example this curious draw. 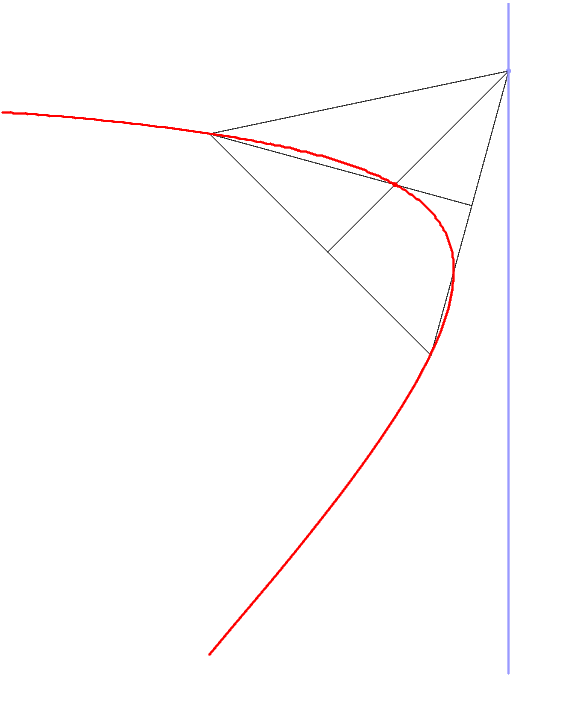 The red line shows the path described by the ortocenter of a triangle as one corner point describes the light-blue vertical line. Finally, and with a big delay --one whole year-- the new version of Metagraf, referred below, is approaching to its end. Almost everything promised is already finished and a lot of new things, included. It could be convenient to begin saving the drawings already done in MetaPost format, as the new version will not be compatible with the actual one. I am happy to say that this is the last time that I have to say such a horrible thing. All versions derived from the next Metagraf-2 will be compatible. From version 2.0 on, all versions will be compatible. The files saved for openning drawings in MG will be text-files, probably included in the metapost file. So the same output file will be read by metapost and by metagraf. New objects of quite sofisticated nature, as NURBS, will be included and translated to metapost&java languages. New capabilities of the variational geometry included in MG will be added. The Manual will be rewritten and this will be done in English and Spanish. This new release of Metagraf (1.31-beta) can be used with any screensize as itself will resize acording with the screen; nevertheless, it is recommended to use, at least, 1024x768. I recall users that I have included a short text file, README..., that will be placed in the directory "metagraf" created. This very short text file, MUST BE READ before attempting to use this last version. There are some more elements for variational geometry (points of intersection between two circles, bezier curve that uses four points as control points...), and small bugs have been removed.